Studies have shown that distress is common among people with cancer, but the types and causes vary. “Research shows that 20% to 25% of newly diagnosed cancer patients and/or survivors are at risk for mood or anxiety disorders, but these problems can go undetected unless they’re considered to be a possibility and then evaluated,” says Barbara L. Andersen, PhD. The days surrounding the diagnosis and initiation of cancer treatment tend to be the most stressful for patients. Failing to address psychological needs, regardless of when they arise, can increase risks for stress and anxiety as well as depressive symptoms. It can also reduce quality of life, increase risks for adverse effects, and lead to more physical symptoms. Treatment for anxiety or depression is often successful and has the potential to reduce the risk of cancer recurrence or disease-related death. “Clinicians may not be able to prevent some of the chronic or late medical effects of cancer, but we can play a vital role in preventing or reducing the emotional fall-out at diagnosis and thereafter,” Dr. Andersen says. If symptoms of anxiety or depression can be recognized and treated effectively, there is a chance that clinicians can reduce the human cost of cancer. Recently, the American Society of Clinical Oncology (ASCO) released new guidelines to help manage anxiety and depressive symptoms in adults with cancer. The document is a clinical practice guideline adaptation that incorporates recommendations that have been set forth from other organizations. 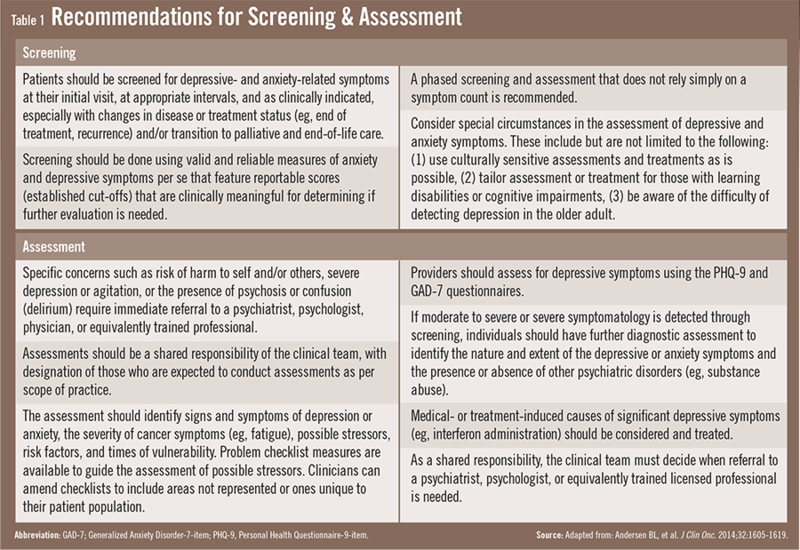 The guidelines detail optimal strategies for screening and assessing patients and offer options for psychological and supportive care interventions for those experiencing symptoms of depression and/or anxiety. 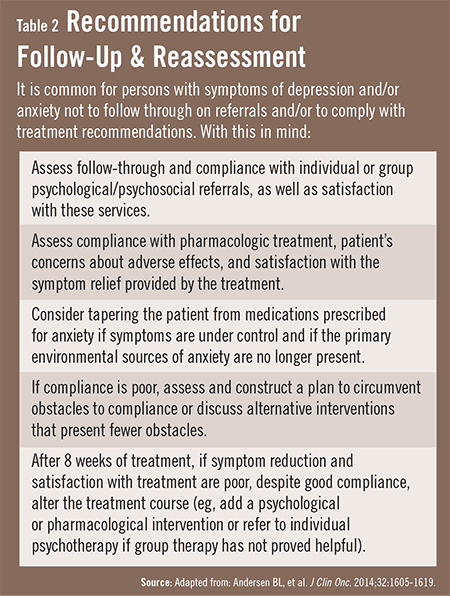 The ASCO guidelines note that healthcare providers should first identify the available resources in their institution and community for treating depression and anxiety symptoms. The availability and accessibility of supportive care services for all patients with cancer are important in efforts to prevent or reduce the severity of symptoms. “Healthcare providers are busy and may not appreciate the impact of depression or anxiety disorders,” Dr. Andersen says. Research shows that psychiatric disorders are more prevalent among patients with cancer than for those with other chronic illnesses. The guidelines emphasize greater vigilance in considering and evaluating depression and anxiety symptoms in patients with cancer. For many survivors, the experience of cancer does not end with the conclusion of therapy. Survivors oftentimes have lingering issues that can affect all aspects of their lives, including physical, psychological, social, existential, and financial worries. “This can culminate in added psychological distress,” says Dr. Andersen. 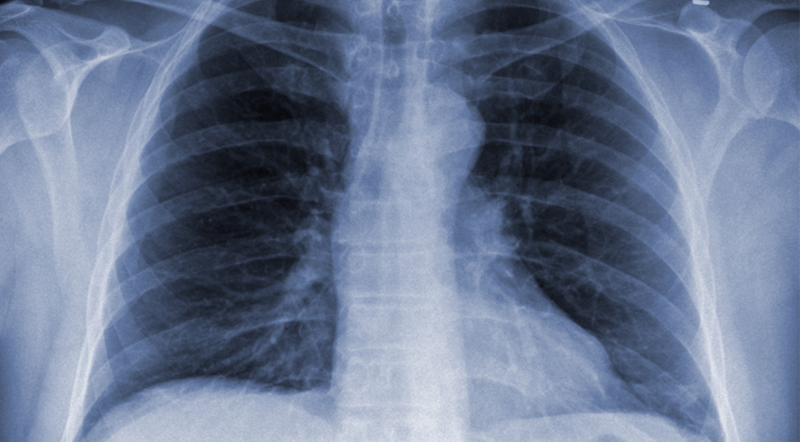 In addition, cancer survivors can also experience other chronic comorbid conditions, such as heart disease, diabetes, or age-related problems, like arthritis or osteoporosis. These comorbidities can further impact patients’ emotional well-being and should be addressed in follow-up care. Andersen BL, DeRubeis RJ, Berman BS, et al. Screening, assessment, and care of anxiety and depressive symptoms in adults with cancer: an American Society of Clinical Oncology guideline adaptation. J Clin Onc. 2014;32:1605-1619. Available at: http://jco.ascopubs.org/content/early/2014/04/09/JCO.2013.52.4611.abstract. Howell D, Keller-Olaman S, Oliver T, et al. A pan-Canadian practice guideline: Screening, assessment and care of psychosocial distress (depression, anxiety) in adults with cancer. Canadian Partnership Against Cancer (Cancer Journey Action Group) and the Canadian Association of Psychosocial Oncology, 2010. Available at: www.capo.ca/pdf/ENGLISH_Depression_Anxiety_Guidelines_for_Posting_Sept2011.pdf. Ganz PA, Earle CC, Goodwin PJ. Journal of Clinical Oncology update on progress in cancer survivorship care and research. J Clin Oncol. 2012;30:3655-3656. Thekkumpurath P, Walker J, Butcher I, et al. Screening for major depression in cancer outpatients: the diagnostic accuracy of the 9-item patient health questionnaire. Cancer. 2011;117:218-227. Chida Y, Hamer M, Wardle J, et al. Do stress-related psychosocial factors contribute to cancer incidence and survival? Nat Clin Pract Oncol. 2008;5:466-475. 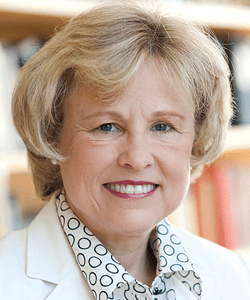 Barbara L. Andersen, PhD, has indicated to Physician’s Weekly that she has in the past received grants/research aid from the National Cancer Institute.